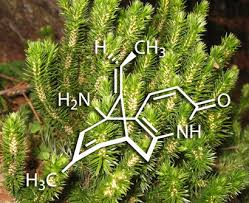 Huperzine A is an alkaloid compound, with basic nitrogen atoms, naturally found in the plant species, fermoss (chemical name: Huperzia). Generally, the Chinese club moss is used to extract and purify huperzine A with the help of laboratory manipulation. This herbal supplement has many nootropic benefits for humans and deals directly with memory and brain’s functioning. A number of neurological problems can be treated with huperzine A, especially Alzheimer’s disease. It is also used to target problems of memory losses and deficiencies in learning. Its effects can further aid to enhance concentration, gain mental clarity and increase the potential to process information. Scientifically, huperzine A is known to increase the amount of acetylcholine in brain and is considered an acetlycholinesterase inhibitor. Acetylcholine is a neurotransmitter between neurons that transmits signals to encode memories. The way huperzine A affects acetylcholine is the same as medications for Alzheimer’s and galantamine, another alkaloid, affect acetylcholine. However, huperzine A is more readily available and cheap comparatively. Acetlycholinesterase is an enzyme which breaks down acetylcholine to recycle it in a continuous neuron process. Huperzine A and galantamine inhibit the action of acetlycholinesterase and thus, lead to increased levels of acetylcholine in brain. Acetylcholine is associated with helping the brain in adapting, learning and storing new information. With the passage of time, levels of acetylcholine decrease inside the brain. Hence, older people can greatly benefit from this nootropic supplement to reverse the decline. Huperzine A’s effectiveness was tested with a number of Alzheimer’s disease patients. Researchers found out that after regular usage of the supplement for 30 to 60 days, most patients had improved memory and thinking abilities. Another research study hinted towards the benefits huperzine A can provide to patients suffering from senile dementia. Although, more research and experimentation are required, to authenticate the positive results. Adolescents, especially students, can use the supplement for boosting formation and retention of memory, especially under stressful conditions. There are no consistent side effects that have been associated with the use of huperzine A, particularly when using the supplement for short term. However, like other supplements, some standard side effects have been reported which include nausea, barfing, loose motions, faded vision, appetite loss, restlessness and twitching. But nothing severe has surfaced till now. But there are certain conditions, during which the use of Huperzine A is to be avoided. People with heart diseases, like bradycardia, should avoid its usage. In some cases, Huperzine A has resulted in a slower heartbeat. To avoid any major issues, it is advisable to consult a doctor before using huperzine A if you have a heart condition. Patients suffering from epilepsy should also avoid using it. As the supplement imbalances the chemicals in the brain, there is a possibility that Huperzine A worsens epileptic seizures. Although, there isn’t much research out there that explores how huperzine A affects during and after pregnancy, pregnant and feeding women should avoid the supplement. Based on scientific research and studies, doses have been recommended for individuals. For people with Alzheimer’s disease and Vascular Dementia, it is advised that they orally consume 50 to 200 mcg of the supplement twice in a day. Old people who have senile or pre-senile dementia (declining of thinking skills with age) should take 30 mcg twice per day. Adolescents looking to improve memory, 100 mcg two times in a day is recommended. There also seems to exist, a relationship between prevention of muscle weakness due to myasthenia gravis, a muscular disorder, and Huperzine A. Such individuals can receive a shot of huperzine A daily if approved by a medical professional.